The US energy storage industry has already enjoyed its best year ever, with 100 megawatts (MW) of new projects installed through Q3 2015 en route to an estimated 192MW of deployment in 2015, but past is not prologue and the industry is evolving – for the better. Annual energy storage installations will grow from 51 megawatt hours (MWh) in 2013 to 3,659 MWh by 2020 on the strength of improving economics and policy developments, predicted GTM Research Senior Vice President Shayle Kann at the keynote speech kicking off this week’s US Energy Storage Summit 2015. Broadly speaking, Kann noted energy storage is the one technology benefitting from “dramatic transformations of the power sector” – decarbonization through the Clean Power Plan, decentralization through distributed energy resources, and vehicular electrification. But while industry growth will be unevenly split across the three individual market segments, Kann predicted new opportunities for them all – depending on how a few key questions are resolved. 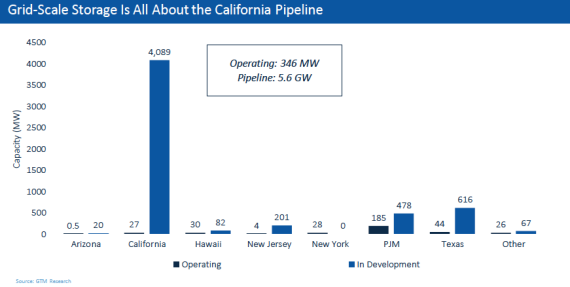 This market segment has been almost entirely concentrated in frequency regulation projects across PJM Interconnection, home to 185 MW of operating projects and 86% of all projects deployed in 2015, but Kann expects California to seize momentum based on a 4.1-gigawatt (GW) project pipeline (out of a 5.6 GW total across the US) under development. Kann also noted 616 MW of new projects are under development in Texas and 478 MW are under development within PJM. However, total installed capacity may not be the metric to judge success in this market segment – watch out for total megawatt-hour (MWh) capacity to judge success, says Kann, who labeled most projects to date “fast acting but low duration.” Average storage discharge duration is currently 30 minutes, but should hit three hours by 2020. Kann also notes energy storage projects will continue to be valuable for renewable energy at a system-wide level, but will not need to be co-located at the same site as renewable generation assets to provide value to the grid. The commercial customer market segment is “in an interesting spot,” said Kann. 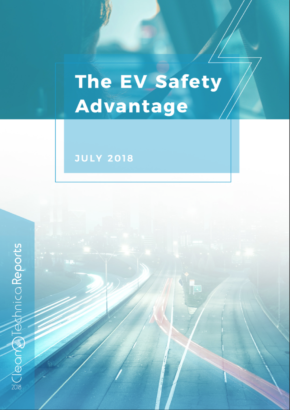 79% of all activity and development in this segment has happened in California (primarily to alleviate demand charges), with an additional 11% across New York and Hawaii. 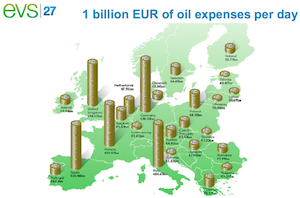 This geographic concentration is primed to spread out, however, according to Kann. 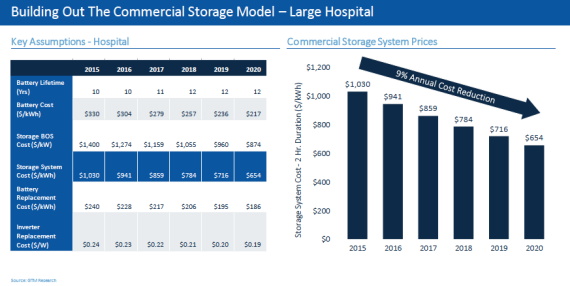 To understand when energy storage economics will work for a large commercial customer, GTM modeled out state economic projections using a large hospital as an example. Assuming a system able to meet 25% of peak load between 300–400 kilowatt-hours (kWh) with a three-hour duration and a 9% annual cost reduction, GTM estimates 8 states will exceed the 10–20% internal rate of return (IRR) required to make projects economics work by 2020 – California, Delaware, Florida, Hawaii, Massachusetts, Michigan, New Mexico, and New York. Under this scenario, project costs fall from $1,030 per kWh today to $654 in 2020. But under a more aggressive outlook where energy storage project costs decline 15% annually, falling from $1,030 per kWh today to $457 in 2020, the states where energy storage will work for commercial customers expand to Arizona, California, Delaware, Florida, Hawaii, Massachusetts, Michigan, New Jersey, New Mexico, New York, and Utah, and Vermont. While fast-falling system prices are “a necessity, not a benefit,” said Kann, other economic factors may also accelerate the market. Demand charges proposed by many utilities to balance out rooftop solar’s proliferation, represent a majority of storage system values, but aggregating projects across the grid and improving system performance can also improve project economics. 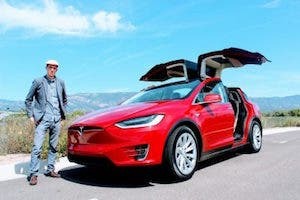 This market segment may enjoy most of today’s popular hype (just consider the Tesla Powerwall), but “it’s not a big market relative to the hype,” said Kann. Only 4 MW of residential storage projects have been grid-connected through Q3 2015, but Kann thinks this is a market segment ripe for expansion. Unlike the utility or commercial markets, residential customers place greater value on backup power, and today’s market is sizeable. 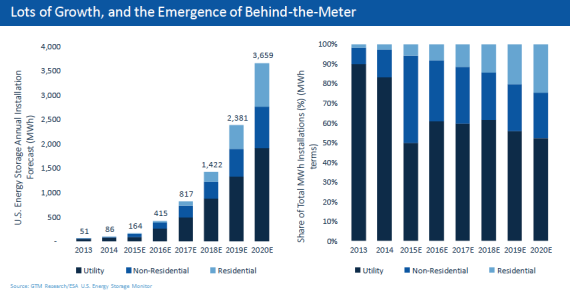 3.5% of all US homes already have backup generators (3.4 million individual units) in a billion-dollar annual market, but just one company serves 70% of this market and almost all units use fossil fuels – making it “ripe for disruption,” according to Kann. 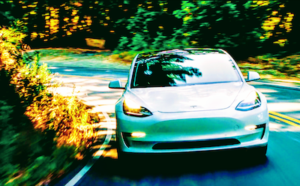 By placing a value on backup, customers may look beyond dollars and cents when considering a residential energy storage project, embodied by Green Mountain Power’s recent Vermont rollout offering Tesla Powerwalls for residential customers — leased for $0 down and $37.50 a month or sold for $6,500. 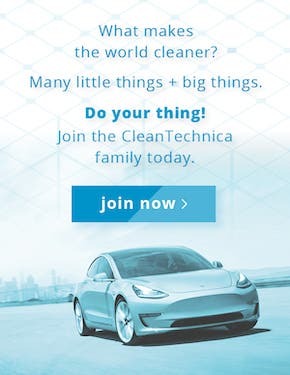 There’s also a middle option where you buy the Powerwall for $6,500 but get a $31.76 credit on your electricity bill each month if you provide Green Mountain Power access to the battery. But even without placing value on backup, solar net metering policy fights may wind up improving the economics of storage. 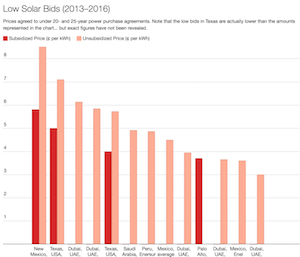 Kann noted Arizona’s Salt River Project utility territory, where regulators approved a demand charge on rooftop solar customers, as well as potential solar self-consumption decisions in Hawaii and California, to show how solar-plus-storage can make sense where the economics of solar alone don’t work. If you’re interested in more insight on the US energy storage market, check out the summit’s video live stream.